What Causes High NO - Nitrogen Oxide - SmogTips.com. Why did my car fail emission test high NO emissions. What is NO. My vehicle failed high nitric oxide emissions test. Produced high NO. Common high NO failures. NO emissions. How can I lower NOx. Common high NO failures. NOx faults. What Causes High NO (NOx)? Nitrogen Oxide or NO is created when an engine's combustion chamber temperature reaches over 2500F. Vehicle manufacturers have designed several systems, which when working properly, lower nitric oxide emissions. Below are common failures which may cause your car, truck, van, suv, or motorhome to produce high high nitric oxide. 1. Lean Fuel Mixture - Lean fuel mixtures cause high NOx. A lean fuel mixture exists when less fuel then required is delivered to the combustion chambers or when more air then necessary is added to the fuel. In either case the lack of gasoline needed to cool the combustion chambers down is not present. Combustion temperatures increase causing high nitric oxide emissions. A lean fuel condition may be due to a vacuum leak/s and/or defective fuel control components, such as the Air Flow Meter, Engine Coolant Temperature Sensor, and O2 sensors. Read about Oxygen Sensor. 2. Defective EGR System- The Exhaust Gas Recirculation system is designed to reduce NO. The EGR system consists of an EGR valve, EGR pressure sensor, vacuum hoses, and one or more vacuum switching valves or solenoids. Later model vehicles may be equipped with electronically controlled EGR valves, which do not require vacuum lines or switching solenoids. Electronic EGR systems will have these components built in. The EGR system's job is to re-route a small amount of exhaust gas back into the intake manifold to help reduce combustion chamber temperatures. As mentioned above NOx is created when combustion chamber temperatures reach above 2500F. By recirculating exhaust gas back into the intake, a small amount of the air/fuel mixture is replaced with inert gas, reducing combustion temperatures. Read about EGR System. 4. High Engine Mileage - Over an engine's lifetime, carbon build-up develops in the engine's combustion chambers. The more miles on your engine, the more carbon build-up on the pistons, cylinder heads and valves. Carbon build-up decreases the available space for the air/fuel mixture to combust, and causes higher cylinder compression. High compression results in high temperatures and high NOx. Keep in mind this problem is usually seen in vehicles with over 150,000 miles which have been poorly maintained. The solution to this problem is called De-Carbonizing. It usually costs around two labor hours at a smog check repair station. It will remove a good amount of carbon out of an engine. This will increase combustion space, lower compression and lower NOx. 5. Engine Overheating - Inadequate engine cooling can will high NOx. 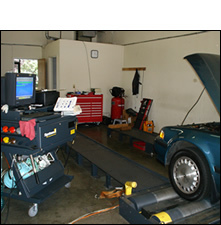 If your vehicle's cooling system is not working efficiently, (i.e. bad radiator, thermostat, hoses) high NOx will be created. Remember high NOx nitric oxide is created when an engine's combustion chamber temperatures reach over 2500F. You will want to make sure your vehicle's cooling system is working properly, and your vehicle's temperature gauge is always indicating normal.